Morgan Wirthlin, a geneticist at the University of Carnegie Mellon, along with her colleagues from other institutes are the first to preform a comparative study on parrot genomes. The study includes over 20 different species of aves while focusing on four species of parrots and dives into their discovery of a section of genes that are linked with the bird's incredible life and cognitive longevity. As you know from this course, the longevity of ones life is correlated to the life of the chromosome's telomeres. As a cell replicates an overhang occurs at the end of the chromosome (telomere) therefore causing the chromosome to shorten by approximately 100bps everytime it replicates. Telomerase is an enzyme that is responsible for the repair of the telomeres so that this reduction in base pairs is fixed. However telomerase is barely active in somatic cells therefore they tend to be reduced which then leads to aging. Wirthlin mentions that parrots are known to live up to 90 years in captivity which is relative to hundreds of years for a human life span! Through our knowledge of how lifespan is limited one can only infer that parrots have increased levels of telomere repair/protection whether its through telomerase or another enzyme/process. Through the study a pivotal discovery was made. In the 344 genes that were looked at from high longevity birds, 6% have been previously noted to improve longevity of model organisms in a controlled experiment. However the other 94% of those genes have never been connected to improve the lifespan of any other organism from the scientific community's knowledge. TERT (telomerase reverse transcriptase) is part of the whole telomerase compound that protects against cell cenescence, which is the cell ceasing to divide. The study showed that TERT had two positive sites in which this was present in high longevity birds compared to zero in humans. This change in TERT activity could be a plausible explanation in the enhancement of the birds lifespan. One drawback was that TERT could have risks of causing increased cell proliferation and tumor formation therefore doing more harm than good. 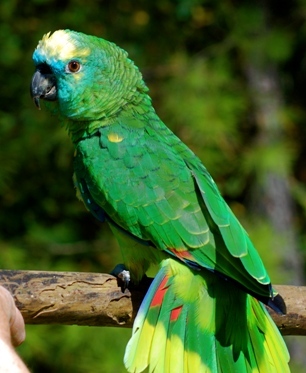 But the parrots also were found to have genes BUB1B, BUB3, KIF4A, KIF1BP, and CCNE1 which link with controlling cell proliferation and tumor formation. The combination of their telomerase activity and cell-cycle regulation could be revolutionary for our knowledge in preventing or slowing down the rate of cancer in mammalian species. This could also be the first steps in identifying what could slow down the destruction of telomeres or even prevent it all together.